In January 2016, the Preservation Society acquired a spectacular suite of giltwood furniture that was custom-designed for The Elms (1901) by Jules Allard et Fils, its interior designer. 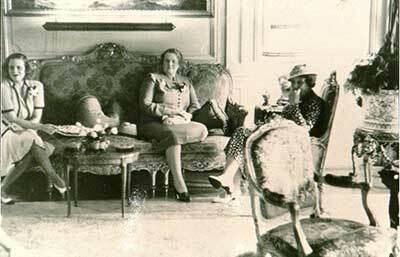 The fabric is not original, as can be determined by historic photographs, including the one from 1928 below, but it is appropriate to the period, and the furniture will be displayed in its current condition until a more accurate historic fabric is identified. This furniture was documented as sold at the 1962 Parke Bernet Galleries auction of the contents of The Elms and has been in a private collection in Massachusetts ever since. The family contacted Curator Paul Miller in late 2015 to alert him that the pieces would be auctioned as part of an estate sale. This acquisition has been an exciting reminder that there are still original furnishings from the Preservation Society's properties “out there” and that it takes a team effort of staff, committee members and trustees to fulfill this foundational part of our mission of preservation. This silver-mounted ebony cabinet on stand was made in Antwerp, Belgium around 1660. Lavishly decorated collector’s cabinets such as this one became fashionable during the 17th century; Antwerp was a major center for their production. This example features silver plaques depicting the Loves of the Gods from Ovid. A similar collector’s cabinet was in the collection at The Elms prior to the 1962 auction of the estate. Attributed to John Goddard, this serpentine form marble slab table was made circa 1755. Goddard was the foremost practitioner of the serpentine style, and his pieces were popular in Newport. This table features a deeply scrolled apron on three sides; the polished marble slab is probably from King of Prussia, PA or Lanesborough, MA and rests on cabriole legs. The front legs terminate in boldly carved ball and claw feet, the rear talons of which have the distinctive extra knuckle favored by John Goddard; the rear legs end in pad feet. This marble and gilt bronze Italian console table was originally part of a set of four, each representing one of the four seasons. In 1780, Prince Marcantonio Borghese commissioned the set for the Hall of the Emperors at the Villa Borghese in Rome. Mr. and Mrs. Cornelius Vanderbilt II purchased this table, which symbolizes Winter, in 1892 for their New York residence. It was brought to The Breakers in 1926. Joseph Meeks & Sons of New York made a set of eight Gothic Revival mahogany side chairs for George Noble Jones, the first owner of Kingscote. 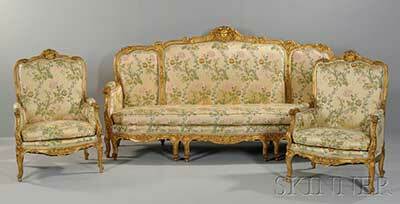 The firm, active from 1797-1868, was one of the leading furniture makers in New York. In 1864, China trade merchant William Henry King purchased the Jones cottage and its contents. The chairs are among the few remaining pieces from the Jones era. The Parisian workshops of Veuve Paul Sormani et Fils created this Louis XV style cylinder desk. It is made of sycamore and has elaborate marquetry. Sormani based this piece on a 1777 French roll-top desk by Andre Louis Gilbert with marquetry by Gerard Peridiez. The 18th century original is on display at the Victoria & Albert Museum in London. This side chair is part of a suite of twenty-five Louis XIV style gilded bronze chairs made for the dining room at Marble House. The workshops of Jules Allard and Sons of Paris created them in Paris, copying them after a set of late seventeenth-century chairs made for Louis XIV at Versailles. Prelle & Cie of Lyons, France wove the original silk cut velvet upholstery. A Rosewood table with a mosaic top composed of marble, malachite, onyx, slate, agate, jasper, and other stones. The center medallion features a micro-mosaic view of the Roman Forum.